During the Vietnam War, our country dropped more bombs on southeast Asia than all sides let loose in World War 2, and doused more than 3,000 of the region’s villages with one of the deadliest substances known to humankind. Those 7,662,000 tons of ordnance – and 13 million gallons of Agent Orange – recognized no distinction between civilian and soldier. America’s war planners didn’t either. When Henry Kissinger ordered “a massive bombing campaign in Cambodia” in 1970, his instructions were simple: “Anything that flies on anything that moves.” Our bombs brought hundreds of thousands of unarmed humans to a permanent stillness by the conflict’s end – and nearly 40,000 more in the decades since. There are Vietnamese children walking the Earth today who will die by stumbling on the landmines we planted, or unexploded ordnance we left behind. There are as-yet unborn Vietnamese babies who will enter the world with misshapen heads and giant tumors as a result of the defoliants we showered on their country 50 years ago. During the Vietnam War, we sent nearly 60,000 American soldiers to their deaths, and condemned more than 300,000 to serious injuries. We did all this in the name of democracy (even though we’d helped the government of South Vietnam block a national unity election, which had been mandated by the Geneva Accords, because it was afraid that it would lose). Or, we did it all because the Communists could not be allowed a foothold in Southeast Asia (even though the presidents who waged the war all suspected that they couldn’t be denied one). But also, during the Vietnam War, a patriotic young American from a military family requested combat duty, and was assigned to an aerial campaign called Operation Rolling Thunder (which would kill at least 50,000 civilians). On his 23rd mission, the young man’s plane was shot out of the sky. He broke both arms and one leg ejecting from the vehicle. North Vietnamese beat and bayoneted him once he hit the ground. Then, they took him to a military prison where he was tortured, starved, and beaten to the brink of suicidal ideation. He was offered a way out of this torment, thanks his father’s clout. But availing himself of that special privilege would have devastated the morale of his fellow prisoners, and handed a propaganda victory to the enemy. So he refused his opportunity for release, and spent the next five years in near-constant suffering – and the rest of his life, as an American war hero. This week, that last story was referenced in the first sentence of countless obituaries. The preceding context was mentioned in virtually none of them. And, on one level, that’s perfectly appropriate. John McCain did not plan the Vietnam War. He didn’t lie to the American people about the nature of the conflict, the atrocities it entailed, or the probability of its success. He merely trusted the civilian leadership that did. There is no reason to doubt that McCain believed he was in Vietnam to risk his life – and then, to endure a living hell – in defense of our nation’s highest ideals. His willingness to sacrifice his own well-being to what he believed to be America’s interests deserves our awe-struck admiration. (As an upper middle-class “soyboy” – whose most heroic feat of self-abnegating physical endurance probably involved a full bladder and broken-down A train – I have no doubt that I’d prove myself a lesser man than McCain, were I ever asked to accept years of torture for a cause that I believed in.) 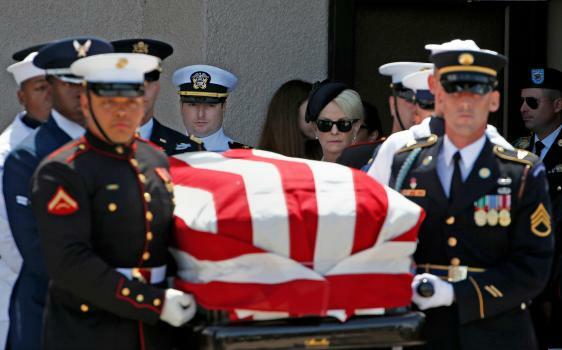 As the senator is laid to rest, one can reasonably argue that respect for his family, and legacy, compels us to isolate his act of transcendent patriotism from the indefensible war that produced it. But there are hazards to such myopia. McCain’s loved ones deserve to take pride in the sacrifices he made at the “Hanoi Hilton.” But we, as a nation, do not. The United States asked John McCain to risk his life – and kill other human beings – for a war built on lies. We asked him to give some of his best years on Earth – and the full use of his arms – to an illegal, unwinnable war of aggression. The story of McCain’s time as a prisoner of war should inspire national shame. It is a story about our government abusing the trust of one its most patriotic citizens. But it’s (almost) never presented as such. Instead, in stump speeches, op-eds, and obituaries, McCain’s service is typically framed as a testament to our nation’s greatness, or an affirmation of its finest values. This distortion invites broader misconceptions. The selfless sacrifices of American soldiers are supposed to be lamentable costs of war, burdens that can only be redeemed by the justness of the cause that demanded them. And yet, the way we remember McCain’s heroism threatens to invert this principle. In celebrating his discrete act of patriotism – while ignoring the question of what cause it served – we risk treating the selfless sacrifices of American soldiers as ends in themselves. [A]s America wrestled with the violence done on its behalf in Vietnam, society came to venerate more those warriors whose courage was exemplified by their suffering and perseverance. McCain epitomized that type of heroism—all the more so because he volunteered to stay in Hanoi and endure more, out of loyalty to his country and fellow captives. His was a valor that even those opposed to the war could honor; McCain’s suffering is a parable for America’s during a long, costly, and polarizing war. In 1971…a remarkable 58% of the public told pollsters that they thought the conflict was “immoral,” a word that most Americans had never applied to their country’s wars. How quickly times change. Jump ahead a decade and Americans had already found an appealing formula for commemorating the war. It turned out to be surprisingly simple: focus on us, not them, and agree that the war was primarily an American tragedy. Stop worrying about the damage Americans had inflicted on Vietnam and focus on what we had done to ourselves. …Americans began to treat those who served the country as heroic by definition, no matter what they had actually done… You no longer had to believe that the missions American “heroes” fought were noble and just; you could simply agree that anyone who “served America” in whatever capacity automatically deserved acclaim. …Although a majority of Americans came to reject the wars in both Afghanistan and Iraqin proportions roughly as high as in the Vietnam era, the present knee-jerk association between military service and “our freedom” inhibits thinking about Washington’s highly militarized policies in the world. This sentiment was not well-received. Hayes quickly issued an apology. And yet, the idea that invoking the heroism of the war dead is “rhetorically proximate to justifications for more war” isn’t a radical one. In fact, it’s a notion tacitly endorsed by president Trump’s own speechwriters. Last year, when the commander-in-chief made his argument for prolonging the longest war in American history – a conflict in which the U.S. has neither a credible strategy for victory, nor significant national interest – he devoted much of his remarks to celebrating the sacrifices of fallen soldiers. …Our nation must seek an honorable and enduring outcome worthy of the tremendous sacrifices that have been made, especially the sacrifices of lives. The men and women who serve our nation in combat deserve a plan for victory. They deserve the tools they need, and the trust they have earned, to fight and to win. But what the “men and women who serve our nation in combat” truly deserve is a country that reveres their lives more than their suffering – and, therefore, that only asks them to endure the latter in wars that are just, winnable, and necessary. If we wish to honor McCain’s wartime-sacrifice, we must remember it less as an example of the kind of heroism we wish to emulate, than of the kind of tragedy that our nation is duty-bound to avoid repeating. I'm constitutionally averse to getting too sentimental over war heroism. It's not that I don't admire physical courage. It's just that I find the exercise of war itself to be so insane that it's hard for me to separate those two feelings. I get it. Wars are part of human nature. And once in great while it's necessary to fight them when some psychopath can only be stopped with awful violence. But humans like wars, really like them, and that's the part I can't understand. War heroism seems to be part of that which is why I guess I'm reluctant to join those sorts of tributes. I would never insult the military. They aren't the ones making the decisions. But neither do I think this military fetish is good for our country. My dad was in WWII and Korea. He stayed connected to the military long after he retired from it and went into civilian life, working in the military industrial complex throughout his life. But he didn't have this obsession with sacred "service" and was actually quite cynical and dark about war and the war machine. This new obsession and the pageantry and pomp wasn't present when I was a kid born in the shadow of those big wars. The romantic patriotism everyone has celebrated this week is very seductive. Who doesn't like the rare communal feeling of listening to the music and seeing the flag flying and believing you re part of some grand idealistic experiment in freedom and opportunity? That's all nice. But John McCain's romantic patriotism also meant that he never saw a war he didn't think America should fight --- all in the name of freedom, of course. If you worship war heroes there's always a need for wars isn't there?